Home > 2015 NFR Stuff by Montana Silversmiths > NFR Silver Scalloped Buckle -- CLOSE-OUT! HURRY, ONLY A FEW LEFT OF THIS CLASSIC ONCE-A-YEAR NFR BUCKLE. GET YOURS NOW BEFORE THEY'RE ALL GONE! NFR Silver Scalloped Buckle by Montana Silversmiths. A silver finished scalloped shaped belt buckle with silver finished large rope etched trip with gold finish side flourishes. 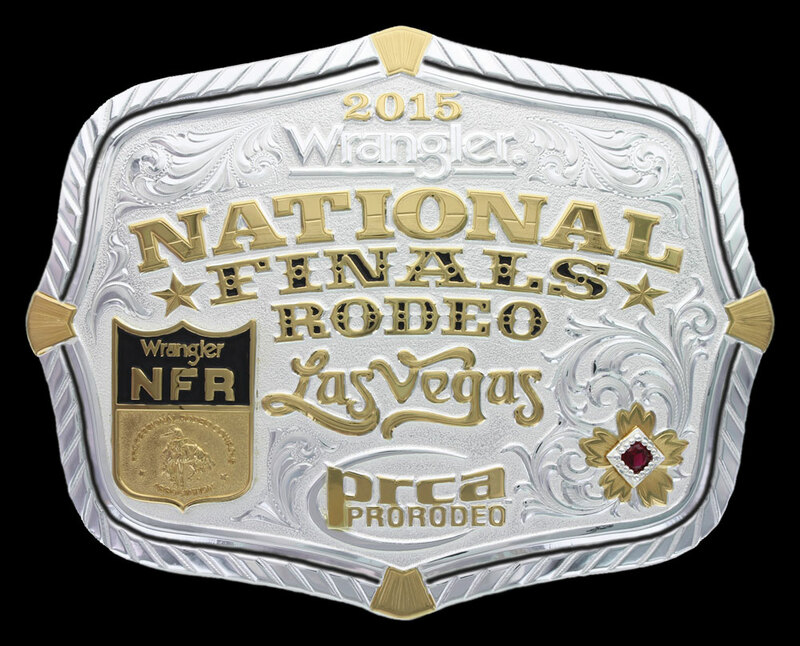 Bold lettering spells out "Wrangler National Finals Rodeo" under 2015 with the WNFR emblem shield to the side of the Las Vegas, Nevada. buckle is fully engraved in the traditional Western bright cut style, the lower right corner accented with a diamond shaped gold finish flower and ruby colored stone accent. 3 7/8" x 4 7/8". Standard 1.5" belt swivel.